Chicago-based brand Oak & Oscar was founded in 2015 by Chase Fancher as a passion project meant to take him as far from his corporate day-job as possible. Three years down the line, and the brand has released now three model lines, and have officially announced their fourth: The Humboldt. 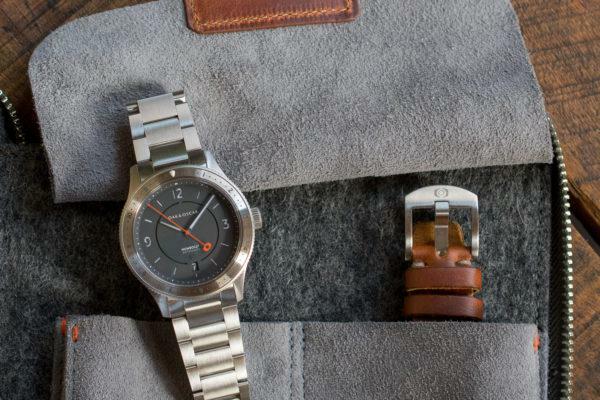 The Humboldt is, all things considered, a fairly simply watch in terms of basic specs and functionality. The piece is housed in a 40mm stainless steel case featuring a brushed finish, and is 12.4mm thick. 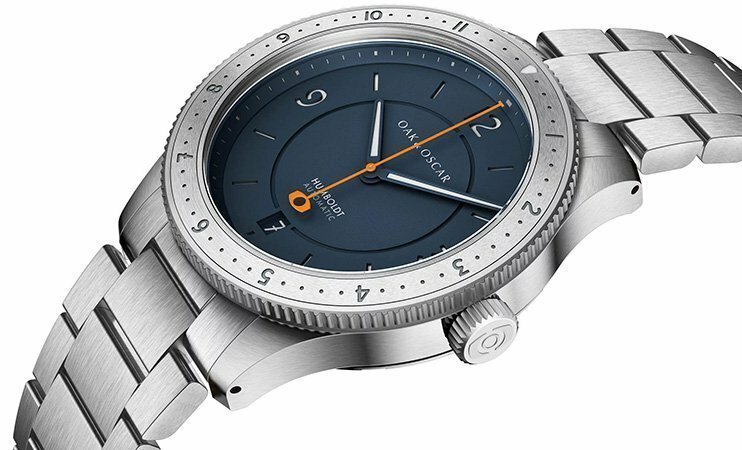 The rotating bezel features a steel insert with twelve hour markings, making for the ability to keep track of a second time zone. For the first time, the brand is employing the use of a stainless steel bracelet, which measures in at 20mm in lug width. The Humboldt is powered by the workhorse ETA 2892-A2, a Swiss automatic movement featuring 21 jewels and a 42 hour power reserve. The Humboldt derives its name from explorer Alexander von Humboldt, a man of the 18th century that Charles Darwin once considered to be perhaps “the greatest scientific traveler who ever lived.” While not a direct tribute to Humboldt himself, the piece is designed to capture the spirit of exploration, and does so through a couple of features. The first of these is the sandwich style dial, which is to say that the main, blue dial, features cut outs for each of the hour markers, as well as the date window at 6 o’clock, and underneath can be found a disc of BGW9 Superluminova. The effect is some added depth to the dial, as well as the ability to provide the dial with more intense luminescence without layering it on the markers too thick and creating what, in Panerai lingo, has become known as a “sausage” dial. The Humboldt also features drilled lug holes for easier strap swapping, perfect for a tool watch of this nature where switching between something water resistant, like the bracelet or a NATO, and something more casual, like a suede strap, is nearly essential. The Humboldt comes not in a standard watch box, but rather, in keeping with the traveling, exploration theme, a travel case that is wax canvas with Horween leather accents, ensuring not just style, but also durability and a degree of extra water resistance. During the launch, the prices are reduced by $100 each. Oak and Oscar is a brand I’ve heard alarmingly little about in the last couple of years. I knew their name, and may have even been able to point out one of their designs, but I didn’t know them with any degree of real, serious interest. The Humboldt, ultimately, doesn’t necessarily win me over on its own, but it does manage to get me to take a closer look at the brand itself, so there’s definitely some winning to be found there. 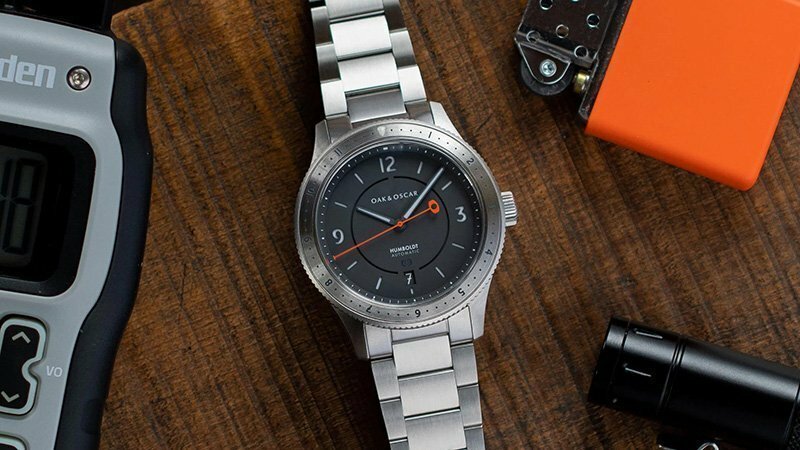 As a watch, the Humboldt just feels kind of neutered, like it was equal parts torn between which famous sports watches to pay tribute to, and also maintaining a kind of design philosophy at large that I’ve never been able to give with. I’ve come to call it “pastel minimalism,” and it’s the same kind of thing that Farer have been guilty of from time to time (not to discredit my love of those new chronographs, because they’re marvelous). Other “pastel minimalist” brands that spring to mind are Boldr and Mercer, to give you a better sense of what I’m getting at – though probably very well made, and packing some supreme value, they ultimately fall flat, to me, because they feel like they ran their designs through a few too many filters on Instagram to earn their “Aesthetic” merit badge. If it feels like Random Influencer X would be caught dead wearing it, then you know the design I’m referring to. Sometimes it sticks the landing, sometimes it doesn’t, and sometimes it doesn’t feel like it even wanted to commit to that soul crushing jump in the first place.